Your award should represent your brand. Not all trophies are golden and sophisticated; some are bright orange and fun! The Orange Blimp is the award given to Nickelodeon’s Kids Choice Award winners! The Kids Choice Awards show is unique and is 100% voted for by fans – and more importantly by kids! There for it needed a unique prize! The orange blimp was introduced in 1990, 2 years after the award show began. Prior to the Blimp it was a gold statue shaped to look like a beret-wearing child standing up with his right leg crossed and holding up a long orange stick, with the word “Nickelodeon” inscribed on it. However Nickelodeon felt that this didn’t represent the Award show, which dumps neon green Slim on its winners, properly. All nominations are kid friendly and can be voted for online on an app by views at home and the most popular wins. KCA has always been creative with how the announce winners opting to do away with the standard envelope and writing the winners names in balloons or on a surf board. 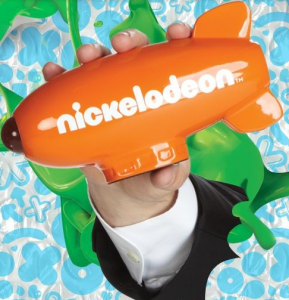 The Blimp Award is designed to look like Nickelodeons signature orange blimp that was used as a logo from 1984-2009. The Award is a hollow blimp figure which also functions as a kaleidoscope. The 2015 Kids Choice Awards will take place Sunday March 28th at 8 pm EST and will be hosted by former Award Recipient Nick Jonas. Do you have a unique event? Let Spike’s Help you design the perfect award to represent it!